Get Software: Join me along with ISACA and TechTarget today to learn about how to advance your infosec career! 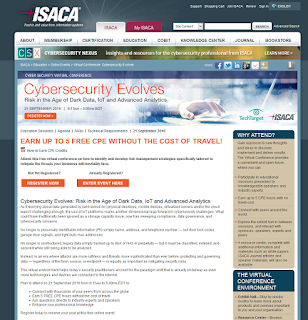 Join me along with ISACA and TechTarget today to learn about how to advance your infosec career! Im happy to announce that Ill be joining ISACA and TechTarget for their annual online security seminar - a day-long learning event for IT and information security professionals. My session this afternoon, which starts at 3:30pm ET, will be I Can Do versus I Have Done...Certification, Experience, and the Information Security Career Path.